Sometimes we come across a message so powerful, so meaningful, and so able to draw us into contemplation that no embellishment is necessary. The Serenity Prayer is one of those messages. Draw inspiration for a life that follows the pathway to Our Lord with the quiet yet deeply moving words of this classic prayer. 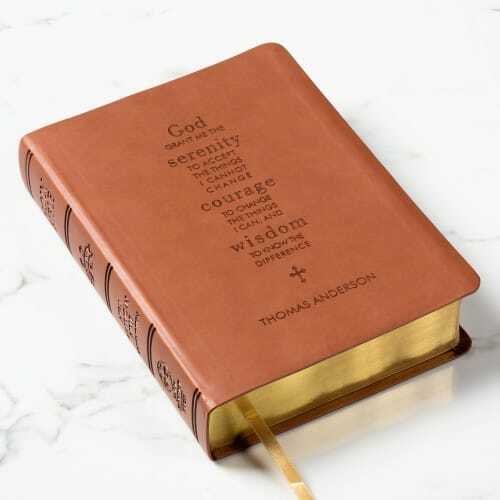 This Catholic Company exclusive piece with the recipient’s name will encourage her faith life and inspire him or her to open God’s Word often. Soft leather-like cover with a satin ribbon placeholder.